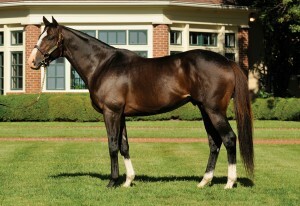 School Board Prez, a dark bay or brown 2-year-old filly by Courageous Cat, jumpstarted her sire’s stud career on Saturday by giving him both his first progeny winner and first stakes winner after defeating ten rivals in the $75,000 Miss Ohio Stakes at Thistledown Racetrack in her first career start. Trained by Doug Matthews, ridden by Jerome Lermyte and tabbed at 12-1 on the morning line, School Board Prez, was bet down to 5-2 favoritism by post time and more than justified the support with a professional and determined performance in the 5 1/2-furlong tilt. After breaking from post 10, School Board Prez settled patiently in sixth in the early stages, five lengths or so off the lead while Ibelieveinmiracles set the pace, running a quarter in 23.04 and a half in 47.80. Making up ground along the backstretch, and advancing between horses in the turn to fourth, School Board Prez entered the stretch four-wide and was asked for run. Passing all her remaining rivals save for tenacious frontrunner Ibelieveinmiracles, the filly then steadily eroded the leader’s margin and surged in the final jump to secure the victory by a head in a final time of 1:06.86. Bred in Ohio by her owner John W. Royer, School Board Prez is out of Torrent of Song, a winning daughter of Torrential who has produced seven winners from nine foals to start, led by multiple stakes-placed Dad Are We Here (Pure Prize), who finished 29 times in the money from 50 starts and earned over $350,000. Grade 1 winner and millionaire Courageous Cat, a handsome 9-year-old son of Storm Cat, is out of multiple Grade 1 winner Tranquility Lake and a full brother to multiple Grade 1 winner and sire After Market. He won six races for his breeders, Martin and Pam Wygod, led by the Grade 1 Shoemaker Mile. He also captured the Grade 2 National Museum of Racing Hall of Fame S., the Grade 3 Canadian Turf S. and the Grade 3 Poker S. and fell just a neck short of winning the Grade 1, $1 million Ricoh Woodbine Mile S.
On-the-board in 11 of his 15 career starts, Courageous Cat retired with earnings totaled $1,165,760 and entered stud at Lane’s End in 2012. He relocated in 2013 to Questroyal North in Stillwater where he has been popular with New York breeders, breeding over 100 mares this spring for a current fee of $6,000.